Kerala also known as the 'God in God's Own Country' boast of physical and natural attributes that attract a lot of tourists every year from India as well as abroad. Besides the physical beauty, Kerala has a rich cultural heritage, which fascinates the tourists a lot. The art and culture of Kerala portrays various dance forms and martial arts performed with the accompaniment of vocal and instrumental music. All these art forms are performed during some celebration or festivity. Kathakali is the most refined, the most scientific and elaborately defined dance form of Kerala. As it is obtained today it is not only complete control of practically every fibre of the artistes body, but also intense senstivity of emotion. 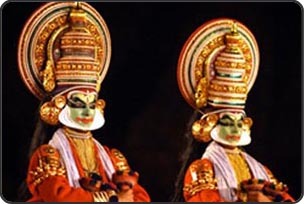 The stories for atta kathas (the verse text for a Kathakali performance) are selected from epics and mythologies and are written in a highly Sanskritisied verse form in Malyalam. The actor does not speak, but expresses himself through highly complicated and scientifically ordained mudras and steps, closely following the text being sung from the background of the stage. 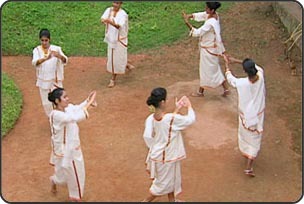 A classical dance form, Mohiniyattom literally means the dance of the enchantress. 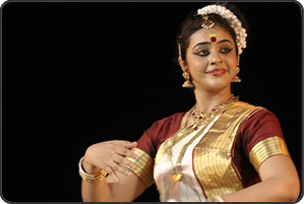 A fusion of Kathakali and Bharathanatyam, Mohiniyattom is a graceful dance usually performed solo. Though there are Nattuvans (Males who give training in Mohiniyattom), Mohiniyattom is generally never performed by males on stage. The costume worn is a nine yard, profusely pleated sari and a matching blouse. Traditional earrings called Kadukkan and Thoda, and necklaces called Illakathaali and Mullamottumala are also worn. 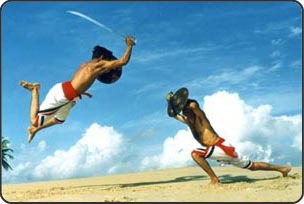 The martial art of Kerala, Kalaripayattu has two forms – Vadakkan and Thekkan. Of these, Vadakkan Kalari is more popular as it involves spell binding moves with swords of various kinds. Kalari is practiced with a variety of swords, spears, daggers and maces of different sizes and shapes. A form of self-defense, Kalaripayattu involves several postures and moves that can take years to be learnt. Chaakyar Koothu Performed in a special dance hall called the Koothambalam, Chaakyar Koothu is performed by people belonging to the Chaakyar community. In this art form the Chaakyar or the performer narrates a story in a humourous way. The Chaakyaar’s face is adorned by smearing soot and turmeric. He wears a huge earring called a Kundalam on one ear and betel leaves and geranium flowers on the other. He wears a girdle and bangles and his head is tied with a red cloth. Margamkali is an ancient art form of the Syrian Christians of Kerala. A dozen dancers sing and dance, around a lighted lamp ("nilavilakku") wearing the traditional white dhoti ("mundu") and blouse ("chatta"). The lamp represents Christ and the performers his disciples. Margamkali does not involve any instruments other than two small palm sized cymbals played by the person who sings the song. Performed on the occasion of a Muslim wedding, Oppana is an art form prevalent in the districts of Kannur, Malappuram and Kozhikode in Kerala. The bride decked in all her wedding finery is seated on a Peetam (A tall chair) and her female friends and relatives dance around her, according to the rhythm of the Maapilapaattu being sung. A purely secular form of entertainment Kummattis (Kummatikali Dancers) can be seen going from house to house to perform and entertain people in return for gifts or food items during the festival of Onam. Kummatis have a heavily painted wooden mask depicting the faces of Lord Krishna, Narada, or Hunters. The dancers wear skirts woven out of plaited grass. Some cover their whole body with bunches of grass for a more bushy appearance. Krishnanattam or Krishnattam a temple art of Kerala, is a dance drama which presents the story of Lord Krishna in a series of eight plays. Krishnanattam is often performed at the famous Guruvayoor Temple in Kerala. The performance involves varied facial expressions, movements and gestures. The eight plays are: Avataram, Kaliyamardanam, Rasakrida, Kamsavadham, Swayamvaram, Banayuddham, Vividavadham and Swargarohanam. This performing art was created by the legendary Malayalam poet Kunjan Nambiar. The Ottamthullal artist is donned in green make-up and colourful costumes and he recites the Thullal lyrics (dance songs), while acting and dancing himself. Earlier Thullal was performed only by men but now it is practiced by women too. The lyrics of the song sung have a satirical touch which lets the artist improvise on the humour. Theyyam is an altered form of the word Deyvam meaning God. The person who plays the deity in the dance is referred to as Kolam which means figure or shape in Malayalam. 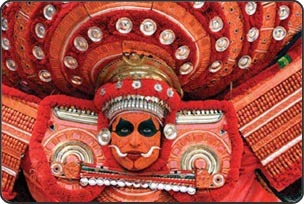 The striking feature about Theyyam is its multi-coloured waist dress made out of long, thinly sliced shreds of bamboo, tied on to the waist with a bright red cloth. Peacock feathers, flowers and palm leaves are also used. An elaborate head gear worn by the performers is hard to miss. So are their painted faces that give an exaggerated look to their eyes and mouth. It is classified as Thaandava, the masculine form or Laasya, the feminine form.